Science can be a fascinating topic, and there are many great kits that make it easy for kids to run their own scientific experiments. We’ve compiled a list of the top science kits for kids, and the products are separated based on age groups. Since every child has different interests, it's a good idea to select products based on age. You can give a child the gift of science at any time, and with a high-quality kit, he or she can perform exciting experiments. The best part about science kits is that they’re equally educational and entertaining. To make your little scientist happy, just choose a kit that is recommended for his or her age group. 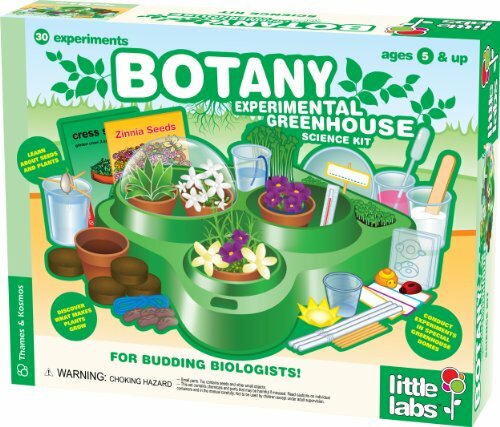 The Thames & Kosmos Little Labs Botany Ð Greenhouse is a top choice for kids who’re interested in botany, and since it teaches the fundamentals, it’s great for younger children. This kit will give your child the ability to experiment with capillary action and plant cells, and it involves the construction of an automated watering system, which keeps plants from going thirsty. The Thames & Kosmos Little Labs allows kids to get their hands dirty with plants, and it’s a top choice for budding botanists. The kit includes greenhouse domes and requires assembly. 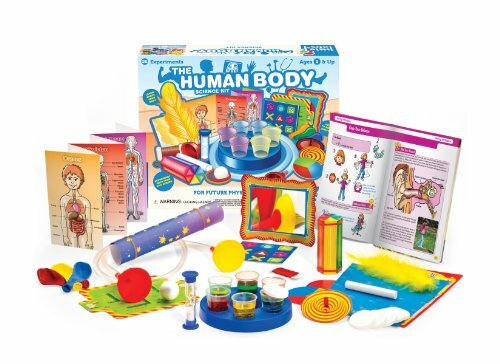 The human body is nothing less than fascinating, and this kit allows younger children to experiment while learning the fundamentals. With the help of hands-on, step-by-step experiments, it teaches children how human lungs work, and it even involves the construction of a magic telescope. The Thames & Kosmos Human Body kit encourages kids to hold a staring content, which highlights how eyes work, and it also contains experiments that involve optical illusions. If you’re looking for an exciting way to teach children about the human body, this kit is worth considering. Here we have another great science toy for younger kids, and with 25 different experiments, it teaches kids about water, air, chemistry, physics and nature. 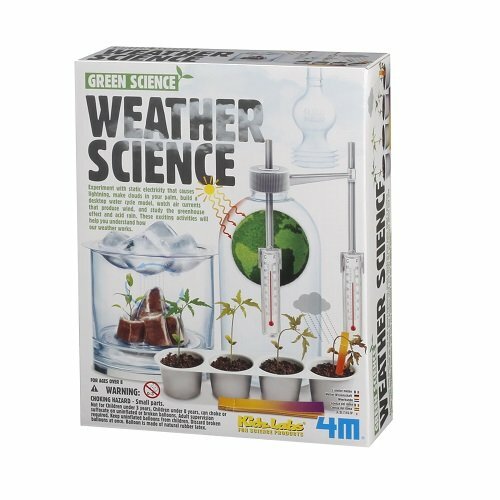 While using this product, kids will learn what is needed to make plants grow, and they’ll even learn how to build a barometer. Some of the included experiments teach kids how water climbs and involves watching plants sweat. This product also teaches kids how magnifying glasses enlarge and how colors mix. With such a large variety of experiments, this product covers all the fundamental areas of science. Engineering has been used to build the world’s greatest structures, and with this science kit, kids can learn the basics of engineering and buildings. This product takes children on an educational journey that involves pulleys, forces, levers and simple machines. The experiments allow kids to engage in engineering projects in water, air and on land. The step-by-step instructions included in the kit are designed for children, and they make it easy to follow along. 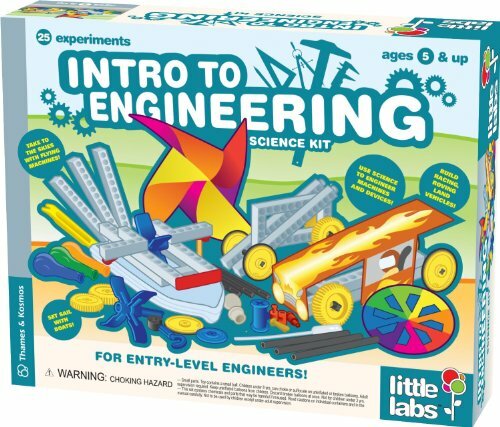 The Thames and Kosmos Little Labs Intro to Engineering is the latest addition to a series of popular products. As an adult, maybe you remember the excitement of building a volcano in school. 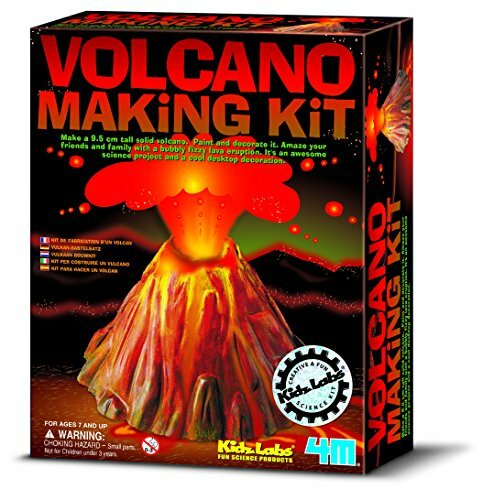 With the 4M Volcano Making Kit, children can enjoy the same feelings of wonder and curiosity. This volcano kit is a hands-on experiment, and it simulates the natural process of a volcano eruption. To produce realistic effects, the kit comes with a stir stick, paint brush, paint, volcano mold and drying plaster, and the detailed instructions make it easy to follow along. If you decide to purchase this product, you should know that it requires baking soda and vinegar, which aren’t included. Here we have another popular science kit from 4M, and it allows kids to experiment with 20 classic optical illusions. The kit is packed with 3D glasses, markers, 3D picture cards and illusion trick cards. Since it also comes with a 20-page book of instructions, the science of optical illusions is revealed in a way that is easy for kids to understand. 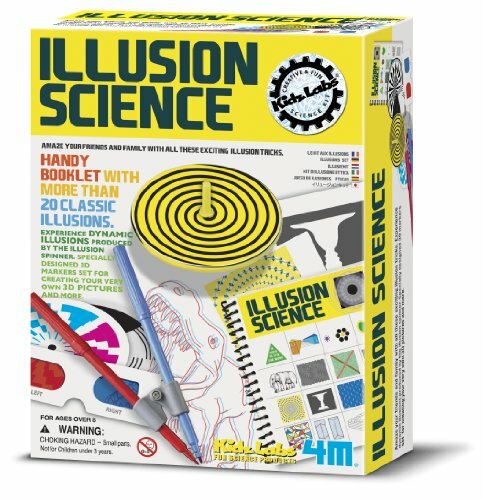 The 4M Illusion Science kit is an ideal product for young scientists who’re interested in optics. This product will challenge your child’s imagination and teach the basics of optical illusions. Disgusting things can bring out your inner child, and the Scientific Explorer Disgusting science kit is designed to teach kids about the things that grow on the human body. They’ll learn cool facts about the body and find out how byproducts are created. 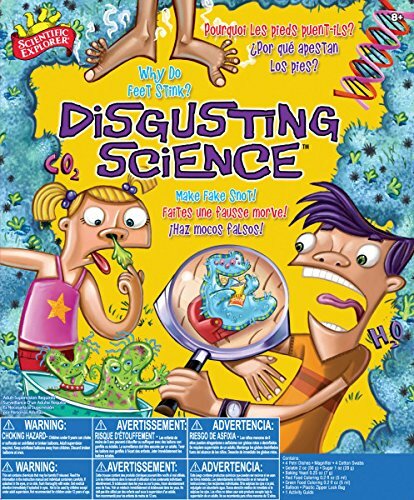 This kit can make kids grossed out and take their science knowledge to a new level. The included experiments allow kids to create slimy snot, stinky intestine and fake blood, and there are even experiments for growing friendly bacteria and molds. The Scientific Explorer Disgusting Science Kit comes with a variety of materials and helps children learn about the disgusting aspects of the human body. Robotics is an exciting field for many adults, and it can be just as enjoyable for young children. With this kit, kids will get a basic introduction to robotics, and they’ll be able to build eight motorized vehicles. However, for proper functionality, it requires the use of a smartphone or tablet. With the app interface, kids can program the robots they build and make them behave based on feedback from an ultrasound sensor. An included step-by-step manual offers 64 pages of instructions and teaches kids how robotics work in the real world. The Snap Circuits Lights Electronics Discovery Kit gives young children an introduction to electronics and involves several hands-on experiments. With this product, kids can build real electronic devices and circuits, and they’ll have access to 175 different projects. The kit also comes with 55 color-coded circuit components, and to see how the circuits react, they can be plugged into an MP3 player or smartphone. 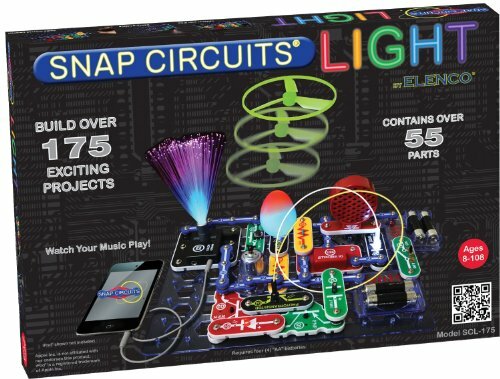 The Snap Circuits Lights Electronics Discovery Kit is a top choice for kids who’re interested in electronics and circuitry. Research on DNA has forever changed the way we understand the human body, and with this unique product, kids can learn about the basic building blocks of life. The components included within the kit are interactive, innovative and exciting. 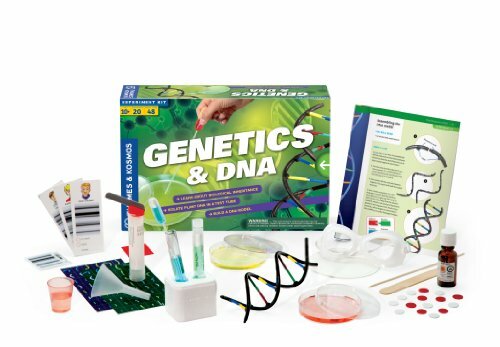 Children can use the ScienceWiz DNA Experiment Kit to extract DNA from fruit and solve chromosome puzzles, and there are eight different science projects that come with the package. A 40-page book delivers step-by-step instructions and helps kids gain a better understanding of DNA and how it works. Magnetism is an exciting field for many younger individuals, and unfortunately, most public schools don’t provide hands-on learning for this subject. The Thames & Kosmos Magnetic Science kit fills the gap in learning and comes with 33 engaging games and experiments. 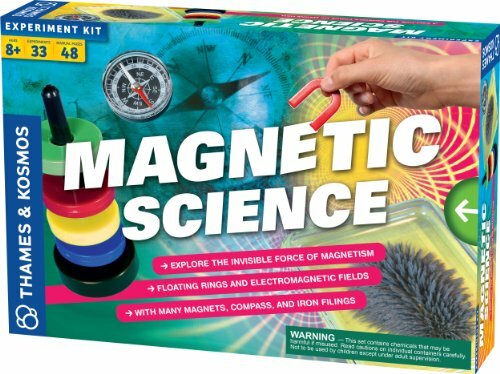 Children can use this product to experiment with magnets of all sizes and shapes, and they’ll learn how to create invisible magnetic fields. The kit even includes materials for building an electromagnet. A 60-page instruction manual outlines the basics and teaches important concepts in full color. Many adults have a fascination with crystals, and kids are no different. 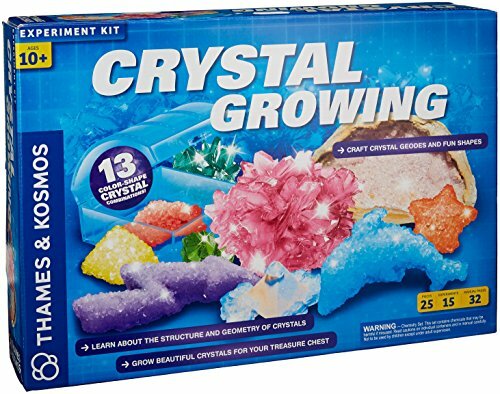 The Thames & Kosmos Crystal Growing kit teaches children about the geometry and structure of crystals, and with the included components, kids can grow dozens of beautiful crystals. The kit makes it easy to create exciting plaster shapes, and the included dyes are great for growing crystals of different colors. The Thames & Kosmos Crystal Growing comes with a 32-page instruction manual and gives children access to 15 experiments. It even encourages analytical problem solving, critical thinking and attention to detail. Genetics is another exciting field, and the Thames & Kosmos Biology Genetics and DNA kit allows kids to isolate DNA from a tomato and learn about inheritance. They’ll also find out how genetic traits are expressed and learn how to build a simple DNA model. The kit includes components that can be used to breed bacteria and experiment with genetic engineering. If you know a child who’re itching to investigate the field of genetics, then this product might serve as a great gift. The Thames & Kosmos Biology Genetics and DNA kit takes children on a journey through reproduction biology, chromosomes and cell components. 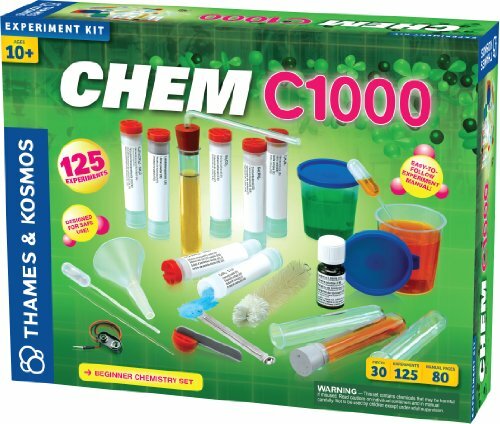 Chemistry is a popular field of study, and this kit can teach a child the basics. It teaches the basics of setting up a lab space and how to safely handle chemicals and lab equipment. Since it contains professional equipment, it allows kids to get the most out of their science experiments. When used in the kitchen, the Thames & Kosmos CHEM C1000 kit is great for experimenting with proteins, eggs, starch, honey, calcium, fatty acids and sugar. With the included components, 125 different experiments can be engaged in, and there is even an experiment for writing in invisible ink. For older children, this is a popular kit for learning about a Nano circuit board. The Arduino is a tiny computer, and it can help kids learn about the basics of computer science, programming and electrical engineering. 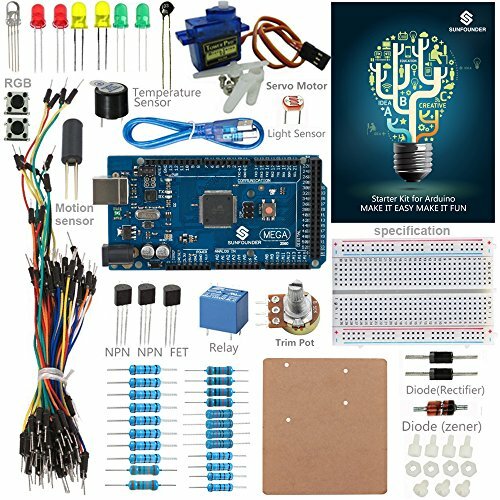 This product comes with a variety of electronic components, and with a detailed user manual, it’s very easy to follow along, run experiments and learn the basics. The instruction manual offers 11 different projects, datasheets, Fritzing images. The SunFounder Starter Kit even comes with a beautiful, protective case. With the 4M Weather Science Kit, children have access to a variety of exciting activities, and they’ll be able to learn how weather works. The kit comes with a set of planets, which are designed to be snapped together, and it also includes a paint brush and two glow paints. Every component needed to build a solar system is included in this kit, and it teaches kids about static electricity, water cycles, lightning and cloud. The 4M Weather Science Kit will challenge your child’s imagination and teach the basics of acid rain, wind and air currents. The 4M Potato Clock is something that any child can appreciate, and it uses an ordinary potato to power a digital clock. 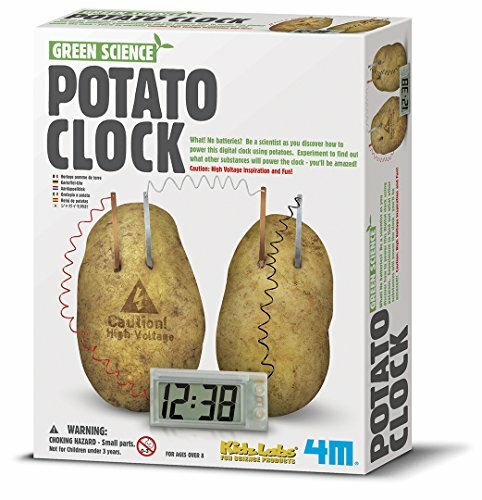 The kit comes with a digital clock, prongs and wires, but you’ll need to supply the two potatoes needed for the experiment. This is an excellent product for young scientists, and it teaches important lessons about green science. Detailed assembly instructions are included, and there are no batteries required. Like all other products from 4M, the potato clock will ignite a child’s imagination and provide a strong sense of accomplishment. 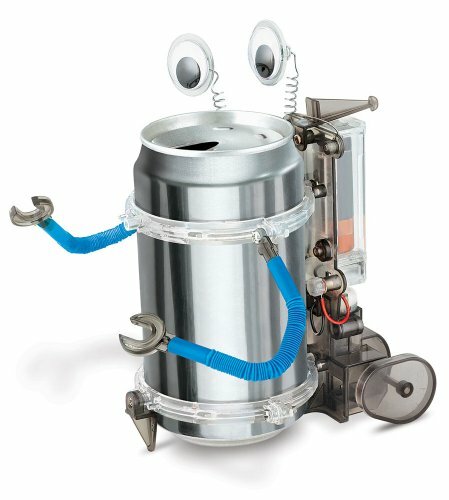 The 4M Tin Can Robot is great for children between the ages of eight and 12, and it involves recycling a soda can and transforming it into a goofy robot. 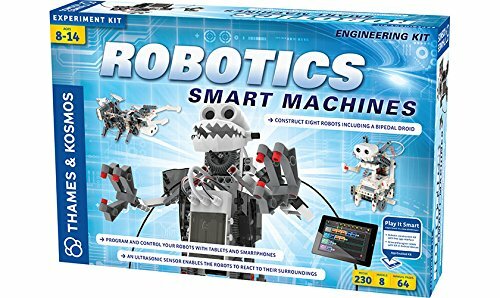 The kit comes with the instructions needed to assemble the robot, and it’s a top product for any young scientists in your family. By repurposing a used soda can, this kit teaches kids the true value of recycling, and it comes with the supplies needed to build a motorized robot. The 4M Tin Can Robot kit encourages creativity, and it gives kids a glimpse into how toys are assembled and how they function. 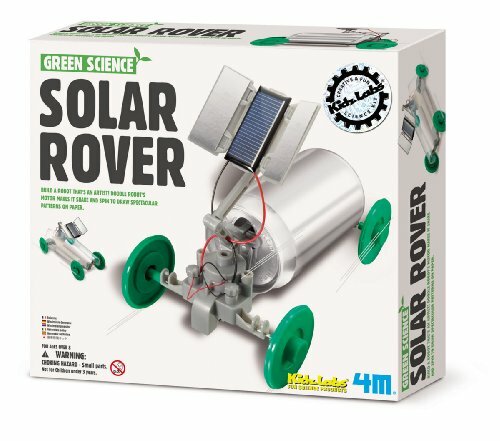 The 4M Solar Rover Kit is another great product that involves a recycled can, and it teaches kids how to transform a can into a solar-powered rover. Every single part needed for the project is included in the kit, and with detailed assembly instructions, there is no guesswork involved. This is a great product for 12-year-old kids, and like all other 4M products, it will challenge the imagination and stimulate feelings of curiosity and wonder. The Toysmith Rock Science Kit is ideal for children 14 and older, and it teaches the basics of classifying, identifying and testing different types of rocks. 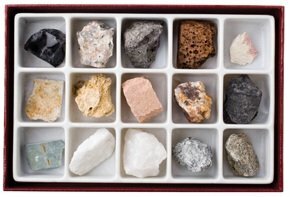 Since it comes with 15 unique rock specimens, there is plenty of variety for older kids. To make testing and classifying fun, this product comes with an identification guide and magnifying glass, and it’s a popular product for those who have an interest in geology. Toysmith is known for creating products that challenge the imagination, and the Toysmith Rock Science Kit is a great example. Why Buy Science Experiments Kits for Children? 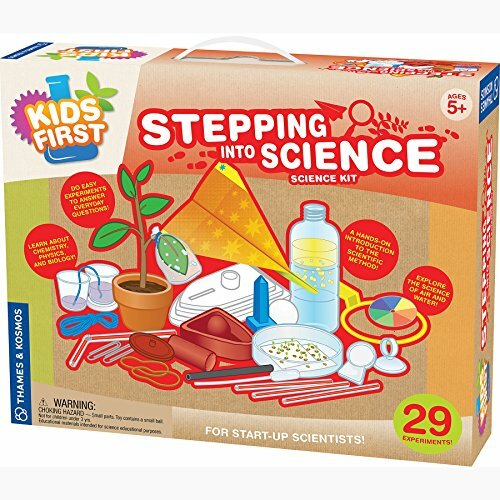 Most people become most interested in subjects that they were exposed to as children, and with these popular science experiment kits, children can learn the basics of many different types of science. There is no shortage of kits for every age group, which makes it easy to get kids interested at a young age. The products in this list teach children about forensics, weather, robotics, optical science, DNA, genetics and magnetism, but there are kits for virtually every area of science known to man. If you’re looking for an exciting, hands-on approach to teaching kids the fundamentals of almost any type of science imaginable, then choose from any of the products on this page.